These categories are set up by the American Hereford Association and the rankings, based on sale averages, are from their records. This record means more to us than any trophies or ribbons from show rings. We have long listened to commercial operators as they tell us about the kind of bulls they need, and we have taken their advice in our seedstock program. These sale results show the strong support that cattlemen have given our big, thick, outcross bulls over the years. It is especially gratifying that a very high percentage of our customers return each year to take more bulls home, because they have found that these bulls really make them money. 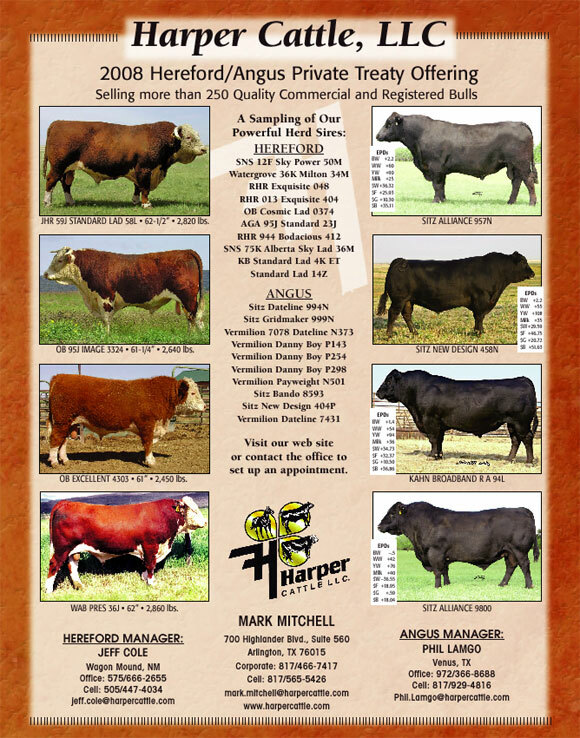 Harper Cattle, LLC has a strong commercial background. We understand what attributes cattle require to flourish in an adverse climate. We believe that the right kind of Herefords have these attributes and this is the reason we have used straight Canadian bloodlines. These lines in our program did not undergo the “tinkering” that resulted in loss of size, bone, thickness, hair, and fleshing ability. Rather, our lines had been bred for centuries to cement prepotency in the characteristics that our own experience and the experience of hundreds of astute ranchers tell us they need in their cattle to conduct a profitable commercial business. Our experience is also the reason we have adopted terms that fit commercial operators in the purchase of our bulls and why we provide free delivery on our bulls. It is also the basis for our guarantee, which is the best, and the best-kept guarantee in the industry. We are fortunate to have listened to our commercial friends over the years, and we plan to keep right on listening.